In the early 1950s my family lived in an apartment house in the 300 block of South Irby Street, right behind the Dairi-O. On the corners of Irby and West Palmetto were First Baptist Church, a gas station, St. Anthony’s Catholic Church, and the Kuker House. The Dairi-O was next door to the Kuker House. The Dairi-O served the creamiest ice cream, piled high and swirled to a peak atop a pointed cone. Folks from all around the county would stop on their way to and from shopping in Florence to park, purchase and enjoy vanilla and chocolate cones. The little building was surrounded by a crushed stone parking lot, tough on a kid’s bare feet, but when mother dressed my brother Harold and me in look-alike yellow sunsuits and little white sandals, the ice cream people thought we were adorable. Free cones and dishes of sherbert were easy to get when you looked as cute as we did. We didn’t pull this off too often; we were smart enough not to wreck a good thing. We found other ways to entertain ourselves. The center of the block behind the house, where everybody’s back yards met, was covered in kudzu for much of the year. All the neighborhood kids laid claim to part of that forest, where trees and shrubbery disappeared in the summer time beneath leafy kudzu vines. Cops and robbers, cowboys and Indians, hide and seek, most any kind of game was more fun in the kudzu. With multiple hide-outs, fox holes and caves, we were limited only by our imagination. The two-story Kuker house on the corner was empty and the fenced yard overgrown with weeds. 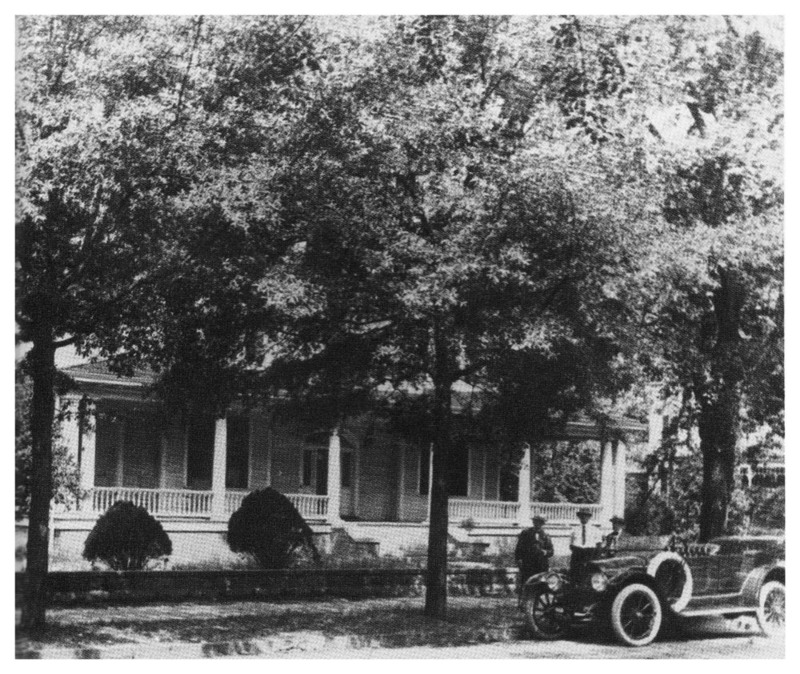 The back yard featured tall trees, shaggy shrubbery and a circular drive-way opening onto Palmetto Street. Our front yard adjoined that back yard, and little kids invisible to cars driving by could find adventure playing among those bushes. One summer day Harold and I felt brave, bored, or stupid enough to take our adventure a step further. We crept up to the old house, found a break in the back porch screen, and wiggled inside through an unlocked window. Thick dusty cobwebs told us the house had been empty quite a while. Why, then, was there still furniture in the house? The living room still had armchairs. Pictures still hung on the walls. In the kitchen we found a table, chairs, and a kitchen range complete with pots and pans! Dishes on the table contained what must have been flakes of dried-up food under a layer of dust. A center staircase led upstairs so naturally we were compelled to explore. Second-floor bedrooms still held beds, sheets thrown back as if somebody had just gotten up. A wardrobe stood half open, hangers jutting out. In an adjoining dressing room, a tiny bottle with a glass stopper still gave off a sweet fragrance. On the floor lay two lady’s slippers, the left and right indistinguishable. A man’s chifferobe still contained shirts and suits. Why? It was pretty dim in the hallway and we were reluctant to go much further. The longer we stayed the more nervous we got — every floor-board creak seemed like the sheriff coming to get us. We figured we’d better not press our luck, so we made our way downstairs, scrambled back through the window and headed home. We weren’t the only kids to explore the old Kuker House. Jimmy Rhodes remembers living in the same apartments one time, and the lure of the old house pulled him in, too. He recalls pocket doors that slid back into the walls, and a picture on the wall of President Taft with a man who must have been Mr. Kuker. (President Taft had made a trip to Florence where he spoke to a huge crowd at what is now Poynor Adult Education Center.) Jimmy also wonders why some furniture was left there, long after the people moved out. And I wonder: how many other kids conned their way into free ice cream at the Dairi-O? How many felt the pull of the old Kuker House? Then there was the day the Martians landed in the kudzu forest… but more about that another time.